The Ultimate Solution for Stator Core and Lamination Repair. The Insul-Core™ Solutions process provides the ultimate opportunity to potentially restore the core plate without dismantling the core, saving labor, eliminating the chance of unsatisfactory restack results and the possibility of scrapping an expensive piece of electrical equipment. It can potentially provide reduced cores losses, core temperatures, reduces significant repair down time improving your operations profit margins; this can be achieved through the application of the Insul-Cure™ Solutions#0409. Core integrity is fundamental to motor efficiency and reliability. Damage to the core is among the first things a good service provider will check – both visually and through testing. For example, a winding failure can create enough heat to melt an area of the core. A bearing or shaft failure can cause the rotor to strike the stator. Extreme care must be taken in the repair process to use proper burnout temperatures (around 680 F) to retain the quality of the steel lamination core plate. Proper handling procedures should be followed for removing the old winding, cleaning the core and installing the new winding. Among other actions, the procedures followed by high-quality shops include conducting a stator core test before and after winding removal, as well as confirming that the core has not been damaged during the repair process. 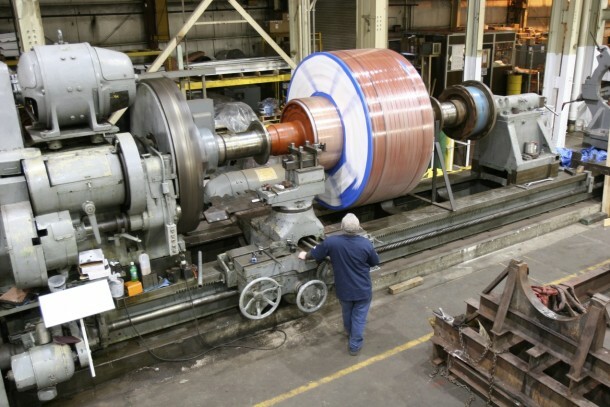 Core loss testing and “hot-spot” testing are vital when it comes to determining the condition of the AC induction motor stator iron integrity. Operational costs and long-term stator winding reliability are the primary considerations. Core losses decrease the efficiency of electric motors and can increase a plant’s utility costs. The Insul-Core™ Solutions LLC#0409, proprietary formula and process is unique and takes relatively little time and is inexpensive compared to alternatives and can generally be completed in one day or less depending on the size of the equipment and the extent of the shorted laminations damaged. The process, when completed, provides a durable core plate layer to the steel lamination thereby providing an integral insulating layer with the steel lamination, where there once was bare steel lamination. Subsequent pages provide an overview of the Insul-Core™ Solutions LLC#0409, with an introduction to the material, processing, some actual field results, thermal digital photos, and operating results prior to and after the processing of Insul-Core™ Solutions LLC#0409.